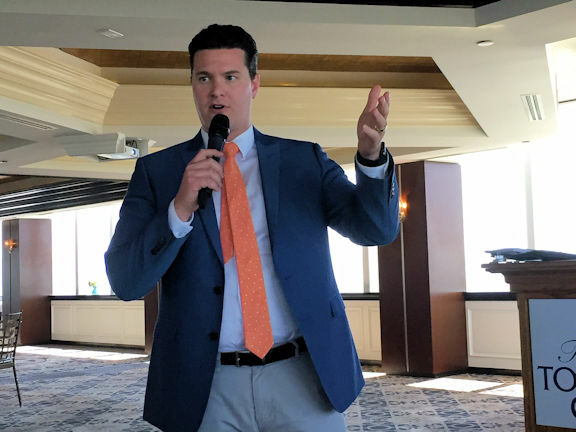 Joey Buttitta, our meeting speaker on Monday, April 9, is a familiar face to thousands of people in Ventura, Santa Barbara, and San Luis Obispo Counties. Joey is the morning news anchorman on KEYT-TV in Santa Barbara. During his visit to Ventura Rotary South, he shared insights on modern broadcast journalism, particularly in the coverage of local news. "We like to be in the middle of what's happening," said Joey, "although to stay safe when covering stories like the Thomas Fire and the Montecito mudslides we keep the motor running in the news van." He noted just how frightening those two tragedies were from the perspective of a field reporter. "It's scary to see what Mother Nature is capable of doing." A native of Ventura County, Joey noted that he was very fortunate to be able to land a news job in the area where he grew up. "I love to tell stories," he said, "and we bring local coverage of stories in the tri-county area to the L.A. regional market." Joey also spent some time talking about his adventure on the CBS television show The Amazing Race, which he and his then-girlfriend, now wife Kelsey Gerckens won a couple of years ago. "Covering 10 countries on five continents in 21 days was the experience of a lifetime," said Joey. "Kelsey and I often ask each other, 'did we really do that?'" Kelsey joins Joey on KEYT each morning, working as the weather reporter on the daily broadcast. "We're both very fortunate to be working where we do," said Joey.